Rick Spilman has spent most of his life around the ships and the sea. Professionally, he has worked as a naval architect (ship designer) for several major shipping lines. An avid sailor, Rick has sailed as volunteer crew on the replica square-riggers “HMS ROSE” and “HMS BOUNTY,” as well as sailing on modern and period vessels along the New England coast, the west coast of Florida, the Caribbean, the Great Lakes and the southwest coast of Ireland. He is also an avid kayaker. 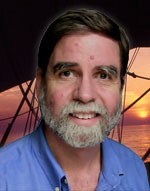 Rick is the founder and host of the Old Salt Blog, a virtual port of call for all those who love the sea. He has been published in the Huffington Post, gCaptain, Forbes online, and several canoeing and kayaking print magazines. He was also a nautical columnist on the Clarion science fiction blog and a Cooley Award Winner in short fiction at the University of Michigan. His video has appeared in the Wall Street Journal on-line and in National Geographic Traveler. Rick lives with his wife and two sons on the west bank of the Hudson River. I am very pleased to have been interviewed by George Jepson in the May/June issue of the McBooks Press‘ newsletter “Quarterdeck.” If you haven’t run across “Quarterdeck” you should take a look. (A subscription is free.) This issue includes my interview and a review of my novel The Shantyman as well as an article, Victory Turns 250, by Julian Stockwin. It also includes news of nautical fiction by James L. Nelson, J. D. Davies, Jan Needle, Steve Harrison, John Cahill, Joseph Heywood, and David Gilman, among others. Definitely worth taking a look. Rick Spilman resides in a lovely late nineteenth century brownstone on a tree-lined street in Jersey City, New Jersey, just across the Hudson River from Lower Manhattan. During the period when Spilman’s home was constructed, New York Harbor teemed with sailing and steam vessels from around the world. By the early 1870s, the prows and bowsprits of the clippers were common sights along piers in the East River, the area known as South Street Seaport. I was invited onto the Mark Forrest Show on BBC radio to discuss the history and importance of sea shanties. A quick five minute interview. To hear more of the program, click here. The Shantyman — Kindle Countdown, Starting at 99 Cents!